Here's my new profile picture; updated since I recently found out I need to wear glasses full time! This is the new me....this is how I look now. As I uploaded it to Facebook.....and began to do the same on Google (and the other social media sites I belong to) I was asked to also update my "Profile!" In addition to a picture, all these sites want a short, written bio of sorts telling about my traits, likes, talents and accomplishments. Originally wanting to keep a "low profile" when I joined Facebook.....my first venture into cyberspace beyond anonymous email; I figured the lower degree of visibility would better protect myself and my family. I have since learned it's okay to share what I can do/have done.....and even brag about it! 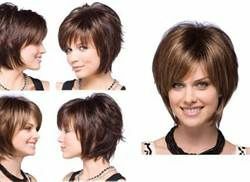 Years ago I had a hairstylist refer to the haircut she was giving me as having a "good profile"......meaning, I'm sure, that it looked good /balanced well with my sagging chin! Now.... absolutely! PLEASE give me a cut/style with a good side view! After my recent Dr. appointment, his nurse called to share the results of my lab work and "blood profile." All was in good shape...in all the correct ranges.... and she agreed to put a copy in the mail to me for my records. The color coded graph containing my data was actually called a biochemical profile. It amazes me how this word is everywhere; how we use it so easily in so many arenas! As a fourth grade teacher and writing coach, I encouraged students to write essays or assessments about the characters in our novel studies...... 'describe the antagonist/protagonist' for example. 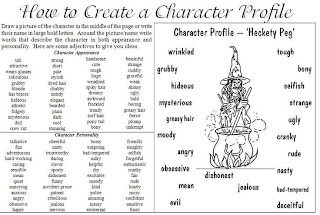 This in turn would help them create and develop their own characters during writing assignments. We called them character traits. 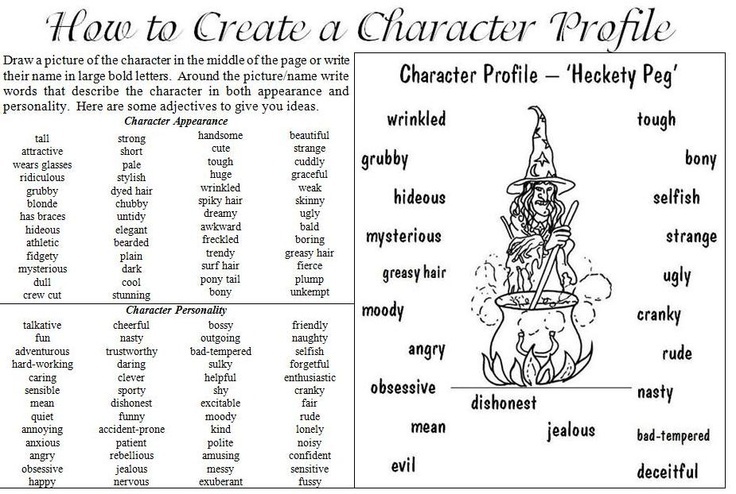 Look how they're referred to now as per a recent Pinterest post...creating a Character Profile! Funny how this writing thing of mine has evolved....AND my sense of honesty/transparency. I had 'change FB profile pic' on my mind.....and as soon as I started to do it......all of this popped into my head. Is this anything worth sharing? Probably not.......it's not a story or informational article......but it does show how far I've come in Cyberville! I'm not afraid to write about whatever and whenever something grabs me! Like the use/overuse? of this neat little all purpose word. It was a fun read! SO when are you going to change your profile picture in your sidebar?! I do like the new one. Thanks, Kc! Believe me....I've been trying for the past week to make the change here! AND on Google+. It just keeps doing that spinning time thing and never uploads. Guess I'll try @ midnight or 5 AM....when internet/websites are not so busy. Joan, I had issues, too. You might try using a different browser. IE10 doesn't play nice with everything -- or is it that Google doesn't play nice? Just a suggestion but I think that is how I got around the issue! Just can't remember which browser did work. Thanks.....funny way to entertain myself! Love this post, Joan! Like you I began my online persona a few years back, trying to be as anonymous and unassuming as I could. I'm adding in more and more of my personality and who-I-am these days. I found your blog via Family Home and Life, and I look forward to browsing your articles. Thanks for sharing all the different perspectives on 'profile' - gave me some food for thought! Thanks for reading and understanding what i meant! Nice to know you found it helpful. I think we're all learning as we go along and gaining confidence from each other. Nice to meet a new fan! Have a lovely week and enjoy those grandkids. I think that's what i get next....bifocals. i still use readers for books and computer. I finally had success changing my profile here on my tablet......and on pinterest ...yaaaay! Just G+ left. Thanks, Kaye.....and Kc for helpful suggestions. I appreciate your support! What a fun read! I like the new glasses. I've work them (or contacts) since I was in the second grade so they are like and old friend to me. I was delighted when laser surgery came available but my astigmatism keeps me from being a candidate. I also enjoyed your latest post and the idea that we can express our random thoughts just for fun. My latest post http://axiesdad.blogspot.com/ seems like that to me, no message, just a random memory I felt like writing down. Exactly! Sometimes I write and have no "point"....like an old Seinfeld episode. But it reads smoothly, is well written and touches others.....so why not!?!? Your memories of boot camp and the Korean War were pretty much on topic I'd say!